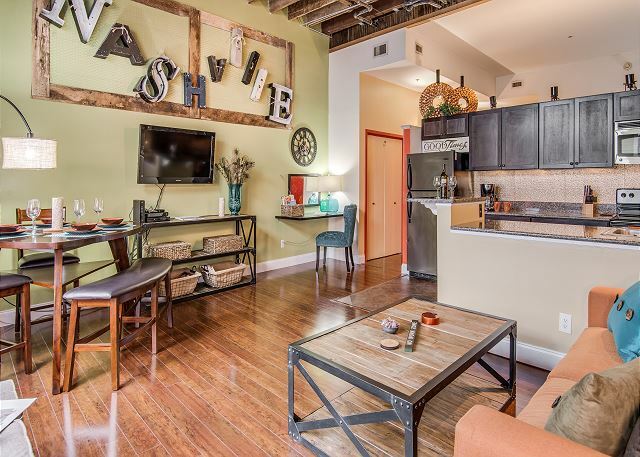 “Good Times Loft”, featured here, is one of our Premier Properties and offers a trendy and unique Nashville-themed decor. Loft, 1 Bedroom + Sleeper Sofa + 1 Twin Rollaway, 1 Full Bath, Sleeps 5! 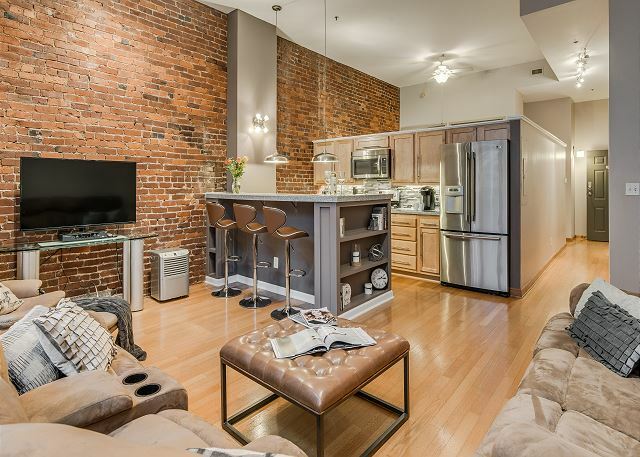 Make your stay in Music City special in this unique, 2-level loft. Bedroom 1: King Bed + Full Bath, Bedroom 2: Queen Bed + Full Bath, Living Area: Queen Sleeper Sofa + 3rd Full Bath! 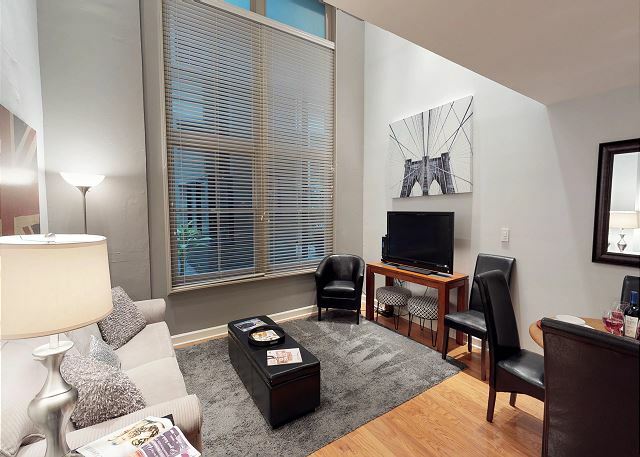 “Downtown Nashville's Urban Getaway”, featured here, is one of our premier properties and is a gorgeous place to call home while visiting; 2 Bedrooms, Queen Sleeper Sofa, 1 Full Bath, & Windows On Historic 2nd Avenue! 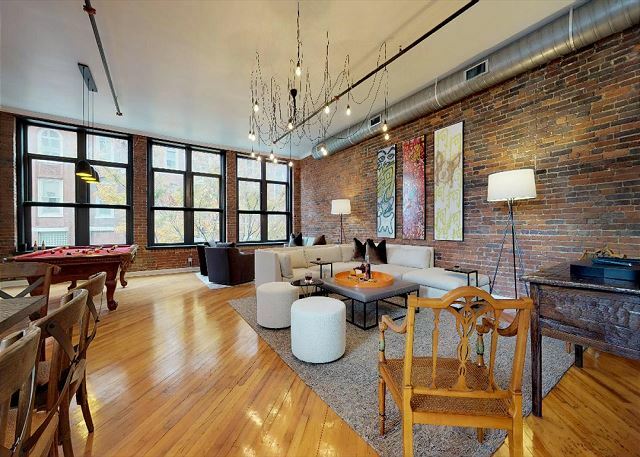 “Rhythm Loft” in the Heart of Downtown offers lots of open space; Sleeps 6 & is fully renovated! Has a King Bed, Full Futon, 2 Twin Beds and 1 & 1/2 Baths. Located in Nashville's "The Row". Walk to Restaurants, Cab to Broadway! 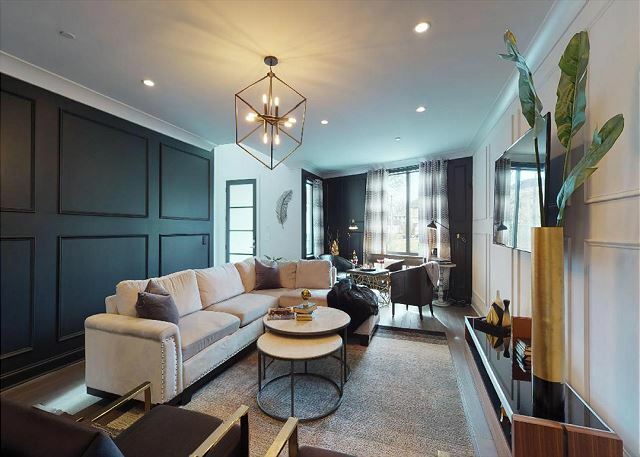 This luxury, modern home has 3 Bedrooms, and a dedicated High Roller Game Room. New condo, large rooftop deck with full wet bar just inside. 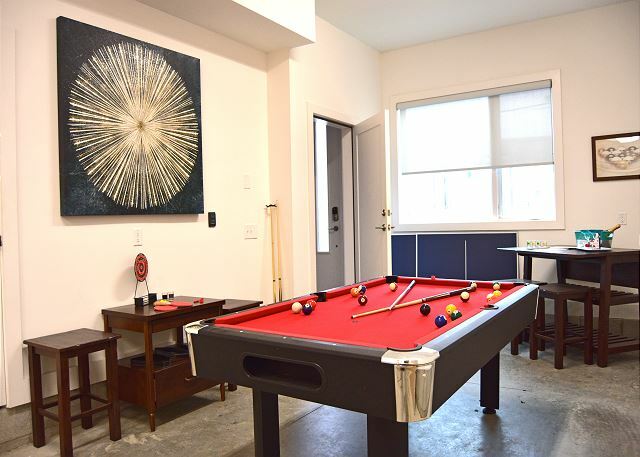 Two Private Bedrooms with en suite full baths, local artwork and about 2 miles from Downtown nightlife and businesses. Close enough to enjoy a skyline view from the rooftop deck. “Modern Urbanist" is an exquisite loft and is a unique Urban Experience in itself! Sleek, modern design, in the heart of the downtown action. With the comforts of home and posh surroundings, this loft will create fond memories for years to come! 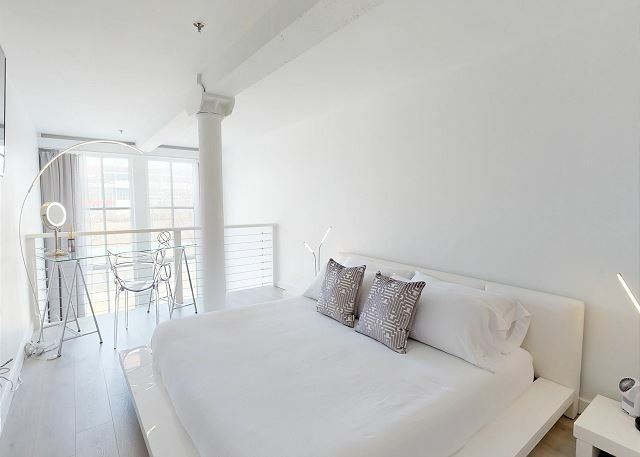 This Spacious, 2 Bedroom Loft is not only INSIDE THE ENTERTAINMENT DISTRICT, it has AMAZING Sweeping Views of Downtown Riverfront Park and the Cumberland River! Rooftop Condo with Modern Flair. Brand new condo. Perfect for Corporate/Business stays or two couples traveling together! Brand new. Lots of Sleeping Options. Comfortably sleep large groups 5 mins from Downtown Nashville. Perfect for couples & families. 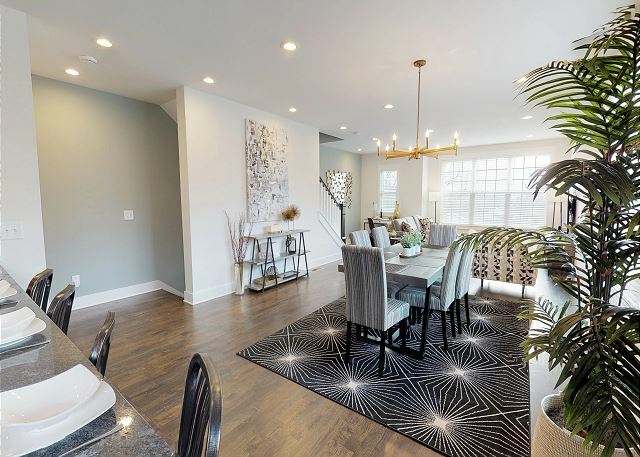 Open concept with beautiful artistry and style. AMAZING Rooftop Deck! Great deals. Contact us direct. Playlist Properties. Where Relaxation Meets Music! Southern Charm and Sophistication, On The Edge Of Downtown, Sleeps 10 in 6 beds with one high-end plush king bed, two plush queen beds, a modern bunk set with two twin beds and a queen sleeper. Must Stay near Music Row! In trendy Edgehill/Music Row, at 12th Ave South! Walk to Restaurants, Minutes from Downtown: Restaurants, Coffee Shops, Honky-Tonk Row Live Music, Museums, Sporting Events, Groceries, Boutique Shopping & MORE. Contact Playlist Properties for specials. 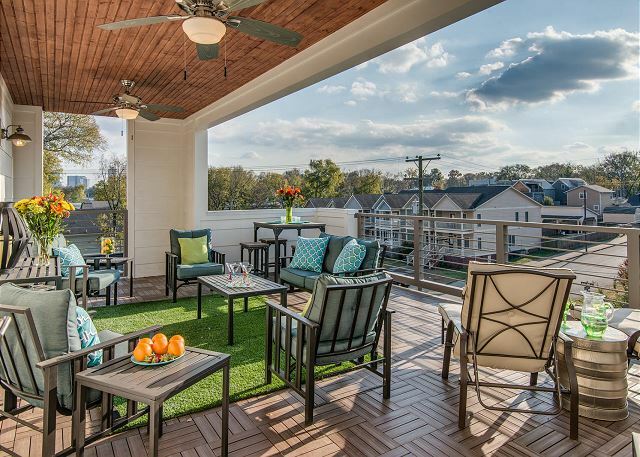 Experience one of Nashville’s Trendiest Neighborhoods near Downtown, 12South! ; Walk to Restaurants, Cab to Broadway & Honky-Tonks! 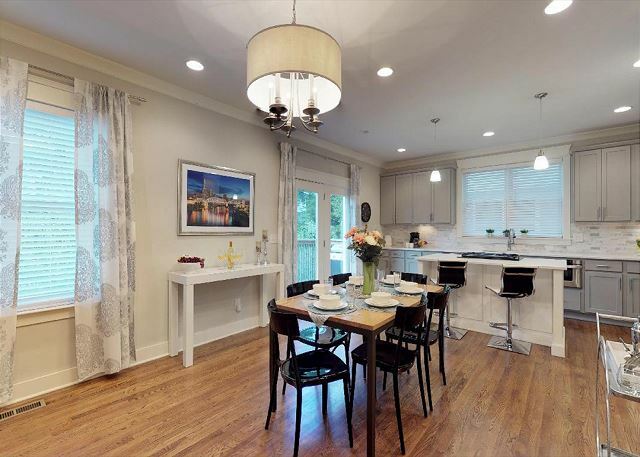 Experience one of Nashville’s Trendiest Neighborhoods near Downtown, 12South! 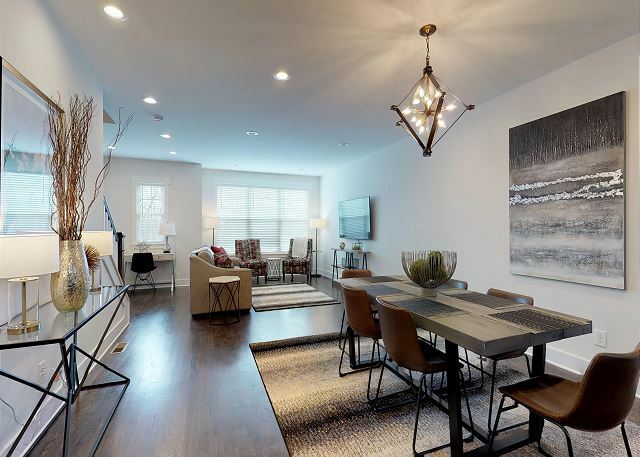 This Brand New, Beautiful townhouse is great for a relaxing and fun time. This HUGE, brand new house is close to Downtown Nashville. You’ll love this home because of the location, lots of space, amenities and number of sleeping options! Hoping to rub elbows at lunch with some of the city’s music executives? Edgehill/Music Row neighborhood is the official home to world-renowned Music Row and should be your ultimate Nashville destination! Downtown Nashville - The Gulch. Walk to Restaurants & Shopping. Conveniently located near Music Row, Music City Center, Vanderbilt, Belmont & Lipscomb Universities. Perfect for Business Travelers and Families who are accustomed to the finer things in life! 4 Bdrs/4 FULL Baths! Edgehill at The Gulch-Downtown Nashville. Walk to Restaurants, Coffee Shops, Shopping, and Groceries. Cab/Uber to Lower Broadway Honky-Tonks, Restaurants, Concerts, Live Music, Museums, Sporting Events, Shopping and MORE. Come to Nashville and bring your friends, 10 Beds! 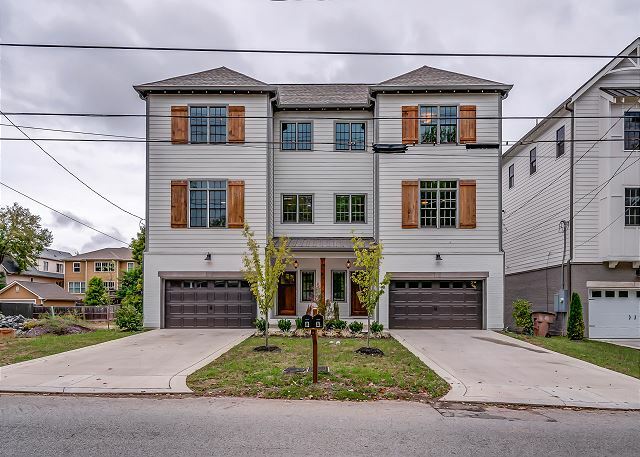 NEW, modern rental just 2 miles from the heart of downtown Nashville! Playlist Properties New Gorgeous Listing – 3 miles from Downtown Nashville! Large 4 bed +3.5 baths; furnished with large groups in mind. Large Back Deck, Hot Tub, Outdoor Grill, Huge Kitchen and more! The whole group can be comfortable in 8 total beds! 4 Bedrooms / 3.5 Baths! Edgehill at The Gulch-Downtown Nashville. 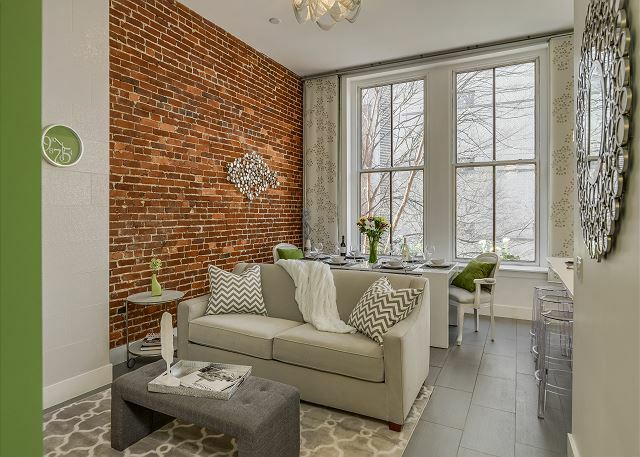 Minutes to Lower Broadway Honky-Tonks 8 Beds, 2 Balconies & Roof Deck with Fire Feature! Gulch/Music Row/Downtown Nashville. Walk to Restaurants, Cab to Broadway! This luxury, modern home has 4 Bedrooms, Each With It’s Own en suite Full Bath. The finishes glisten and ooze with sophistication & luxury. Large 4 bedroom + 2.5 bath historic home, newly renovated, and furnished with large groups in mind. 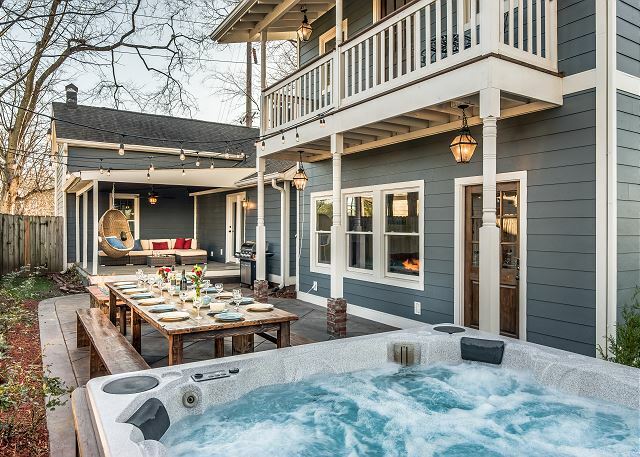 Large Patio, Huge Hot Tub, gas outdoor Fire Pit, and all the amenities to ensure an amazing Nashville experience! Nestled in the heart of downtown Nashville, this historic loft is unique; artfully styled to reflect the history of the building, yet ultra-modern and clean. 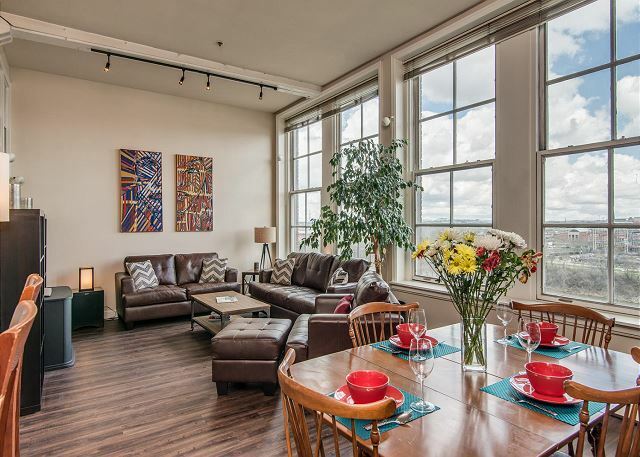 River View Loft-Center of Downtown! “River View Loft” Downtown offers lots of space, Sleeps 4 & has a RARE view of Nissan Stadium and the River Downtown! “Musician's Loft” has a clean modern style and is in a PRIME, walk-able location. Queen pillow-top in the bedroom, and queen sleeper in the living room. This new condo is nestled in the urban development of The Vue. 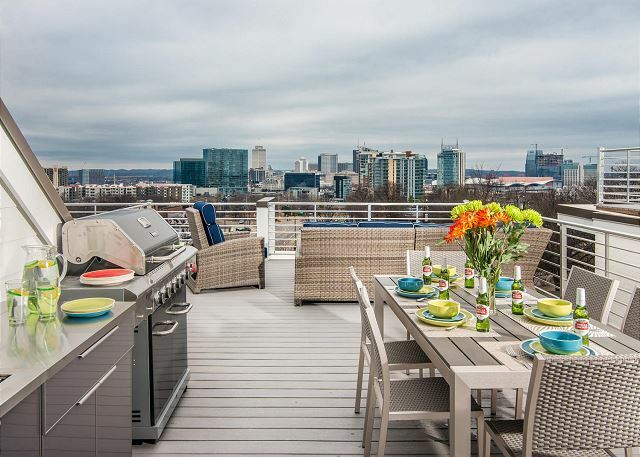 Enjoy a Nashville City Skyline “Vue” to the south from the large, well-appointed roof deck!